← Your frameless glass pull handles, can they be used on 6mm thick glass/polycarbonate? 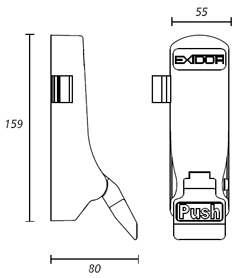 What are the dimensions of the Exidor 297 push pad? The Exidor 297 is 159mm tall x 55mm wide x 80mm projecting. You can see dimensioned diagrams, plus loads of other info on the pdf at this link (pdf’s towards the bottom of the page). This entry was posted in panic hardware and tagged dimensioned diagram, Exidor 297, panic hardware, push pad. Bookmark the permalink.